Railway in the UK that carried passengers at the time. The quarry was buit and worked by prison labour. wagons that were used. The station was a completely bare, island platform. The overbridge at the top of Lendrum Terrace. Looking south. have even saved the branch from total closure back in the latter 40's, and who knows, may still be open today! ahead into the quarry and station in a cutting, with a spur running off to the left. Lendrum Terrace overbridge. Looking north. and the crunching of stone in the distance. However, you would hae seen the station platform from here, straight up ahead. remained a firm favourite, with many childhood memories with me. Looking south along the trackbed towards Lendrum Terrace overbridge. From the A90. Remaining embuttment where the prison railway crossed the A90 and ran on an embankment towards the South Breakwater Peir. The embnakment running towards the breakwater pier. The lost village of Burnhaven was just up ahead. The railway embankment running towards the breakwater pier, with the Power Station at Boddam in the background. This was the the area of Burnhaven village, which no longer exists. Peterhead South Breakwater. Site of the Prison Railway terminal yard. The prisoners built much of the prison as well as the railway and the long breakwater peir. Also comment on the lost village of Burnhaven. N.B. this is spoken in the local dialect known as Doric. Both by Youtube user known as Kintakintyea (Interesting that it reads, in English, "I knew I knew you". Weel done, loon. than northwards towards the sea. (See 'Nov.' comments below). when he lived in Peterhead. first 17 years of my life in the prison quarters on Seaview Gardens. disappear to make way for a new sewage treatment plant. and we would grass sled down the embankments during the summer. Road at Burnhaven School (which is the School that I attended). with a nice sharp turn onto the what was the old railway bed. plant underway. I was also quiteshocked to see how imposing the power plant stack was as you drove towards Peterhead. rocks. The hill on the way down to the water had a row of closely spaced cottages at the side just like the ones shown in the Photo. In fact, I remember as a boy the last one caught fire and the old man who lived in it perished in the blaze. I believe that the old man iswalking up this hill. 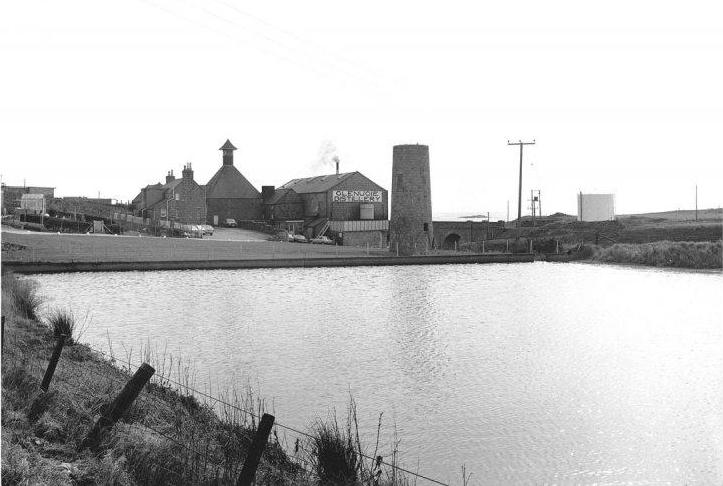 Glenrugie Distillery, Peterhead. This no longer exists. You can just make out the railway embankment and an overbridge to the left of the chimney stack. or we would walk along the shore from Burnhaven. If you look at the bridge in the Photo with the old man, you will notice that there is quite a long wall at either side of the bridge. This is why I am quite sure that the bridge in the picture is the one by the Prison work yards. On the 17th of September 2016 I enjoyed a visit to Maud Junction Station Site (Waling from Mintlaw to Maud and back). on display at the Prison, which is now a Prison Museum. in the 1890's and was expected to take 25 years. However, due to delays by the two World Wars it was not completed until 1958. The branch was closed and dismantled immediatly after completion of the work. The coach & wagon are displayed on the Up Fraserburgh platform. The small four-wheeled wagon was probably used for carry tools and utilities and/or expolsives. This was was on display at Peterhead Prison for some years. Left: As seen from the Island platform. Right: Seen from the Up Peterhead platform. This is roughly where the footbridge stood between the two platforms. The coach consisted of a single doorway and a line of barred windows along the top edge of the coach. they have no understanding of the historical importance of things and the work ad expense that went into preserving things for the betterment of society.